Les abonnés à Fanfare Magazine ont accès aux archives du magazine sur internet. Subscribers to Fanfare Magazine have access to the archives of the magazine on the net. Les Witches is no stranger to Fanfare’s pages. The five-person ensemble (with guests) has featured repeatedly here over the years. Their programs typically focus on a few late 16th- and 17th-century European nations, when popular and classical music were integrated thanks to a prosperous middle class and a tsunami of sheet music. To these works, Les Witches brings classical training, folk traditions, and detailed scholarship—though they typically avoid any discussion of the latter in their slender liner notes, preferring atmosphere-inducing comments. This set combines three of their previous releases. I reviewed Nobody’s Jig (Fanfare 32:6) in 2009, but neither Lord Gallaway’s Delight (subtitled “An Excellent Collection of Dances and Gaelic Laments”) nor Manuscrit Susanne van Soldt (subtitled “Dances, chansons, and psalms of Flanders, 1599”) appeared here. The first album took its selections from John Playford’s 1651 publication The English Dancing Master. The second relies upon publications dating from 1750 to 1903 for its Irish tunes, though the actual date of composition in at least a few instances is likely much older, based on stylistic issues. (The album’s Ragg Set by a Gentleman, for example, shows up earlier, in a 1724 Dublin publication by John and William Neal.) The third uses selections from a manuscript probably compiled during the 1570s and 1580s for the wealthy Dutch merchant Johannes Paulusz van Soldt de Oude. Though never stated as such, all the 54 works are arrangements, and all are by Les Witches. These involve not only textural adjustments for the instruments they use, but the addition of divisions, countermelodies, and traditional folk sets where one tune immediately segues into another. This makes sense within a cultural framework that viewed the printed score as an early stage in the performance process. Musicians playing these pieces have a lot of decisions to make and a lot of room for personal choice, within stylistic parameters that were (fortunately, for us) explained and illustrated in popular instructional manuals of the day. Les Witches does a fine job navigating this terrain, having no difficulty combining scholarship with energy and life. 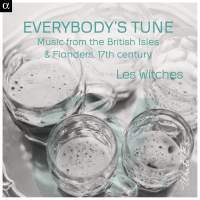 This isn’t to say that another ensemble couldn’t find other solutions to the music’s presentation, but that the ones Les Witches proposes are in general both sensible and highly listenable. Of the three albums, the outlier is Lord Galloway’s Delight. It really is an Irish (or in some cases, near-Irish, given the penchant for musicians in one region adapting the works heard from another) folk album, as good as any by such traditional groups as The Chieftains. By contrast, both Nobody’s Jig and Manuscrit Susanne van Soldt occupy that mid-ground of tunes and arrangements that could be classified as classical, folk, or classically arranged folk, at a time when such a classification would have drawn a blank stare if the question was raised. All three are performed with technique to spare, a situation that would not have likely occurred in real life Celtic line dancing, but is certainly welcome on record. One might reasonably question whether Susanne van Soldt and her family would have appreciated a musician running showy divisions on their Protestant hymn Ghij Herder Israels Wylt Hooren, but we’re not them, and the result is a welcome tour de force. The only reservation I have is over a complete absence, not only of identified sources, but even of composers. It’s not difficult to recognize Orlandus Lassus’s Susanne un jour in the theme to Susanna Vung Jour, but what of Preludium? Stanes Morris? Myn God Voet mij als myn Herder? That minor note aside, I have no hesitation in recommending the set. But your purchase should be conditioned in part by whether you like Irish folk music. If you don’t, Nobody’s Jig and Manuscrit Susanne van Soldt can be bought separately for a few dollars less. Otherwise, all three together are certainly less expensive than if they were purchased separately.